Today we went ahead and distributed the AFIT token bonus rewards. A total of 180,000 AFIT tokens were sent out, as well as 500 ENG tokens. Also as highlighted yesterday, the sale order for the AFIT tokens will remain in place so as anyone looking to still buy AFIT tokens at discounted pricing can still do so. This order will remain in place for the coming 1-2 weeks. Last week's Facebook competition has come to completion! We are happy to have had 31 correct answers to the poll. Winners will receive their rewards by tomorrow! If you participated in the competition and answered correctly, make sure you contact us on Facebook and confirm your Steem username. Six days to win.. Good luck! During last week, our actifitters and delegators piled up more tokens. 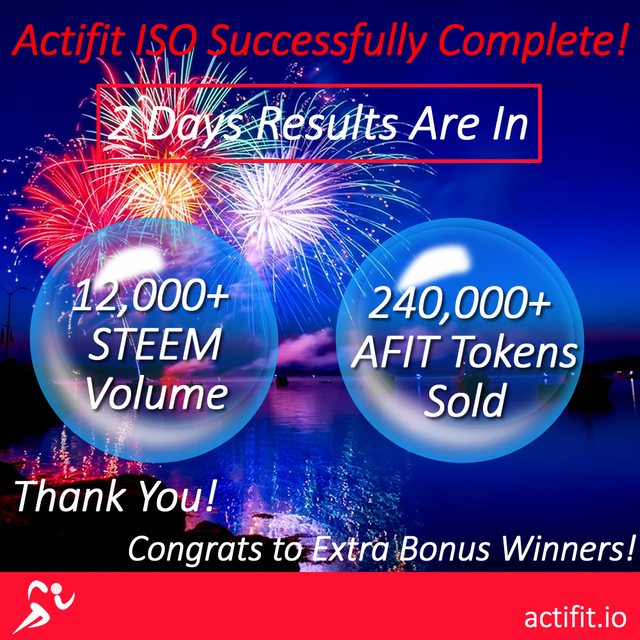 To date, Actifit has distributed more than 31 Million AFIT tokens, to 44K+ token holders and 77K+ reported activity. We also sent out today our weekly STEEM delegators share, which went out to 507 delegators, with a total amount of 157.981 STEEM and 48.074 SBD. Please note that amount below DO NOT include liquid AFIT tokens, available on steem-engine. We are ranked at position 41 as actual, and 40 as active rank, due to utopian-io disabling witness service. We received votes from 817 steemians. Thank you for the increased support! No blocks were missed during the last week. Since our launch of the witness server, we have missed one single block. We are witnessing an average of 25 blocks per day. Our latest voting round included 534 rewarded activity reports. Today's Random Double Up Reward went to @bartonfitness! During the last voting round, we were happy to welcome the below new actifitters, joining more than 2,500 unique users who had posted an actifit report. Our recent joiners are: @blueboar3, @enm1, @stimp1024, @superlao, @softa, @mspbro, @pramanu, @mr-greens, @pippo84, @lill0, @bearone, @gawyn and @rainingfall. Actifit is continuously receiving additional delegations and support. Thanks to everyone who is extending their support to Actifit. Thank you for this update. I haven't looked into your Facebook competition yet, but I will make sure to check it out right away. As always, your post is well-written and very informative. Once again, you did a really good job in terms of content. I like all the information provided, and I appreciate the fact that you took the time to share valuable insights about your witness and delegation status. By the way, it's great to see more and more SP being accumulated, and I think that all the support you have received is well-deserved. In conclusion, you managed to compose another very informative blog post, and I appreciate the effort. Keep up the good work. Thanks @actifit I am glad again I am seeing my name Minton in actifit top 20. When will AFIT be able to be traded for STEEM? Will that also be on @steem-engine ? The AFIT which have been sold/bought on Steem-engine can already be traded for STEEM. This is great news about ISO. Great going..
Well done, folks in the top 20. You are doing fabulous. Welcome to those with your first posts. I wish you many more reports. Wishing all the best to my fellow actifitters! You made more than 78000 comments. Your next target is to reach 79000 comments. You have been flagged. Good day.